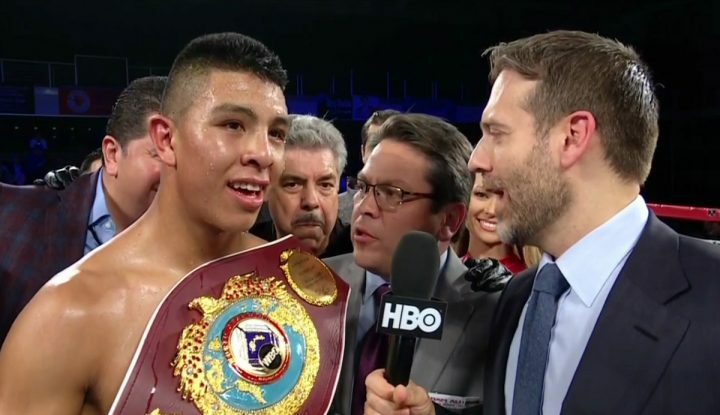 By Sean Jones: Jaime Munguia (29-0, 25 KOs) brought in respectable ratings for his first fight on HBO last Saturday night in stopping WBO junior middleweight champion Sadam ‘World Kid’ Ali (26-2, 14 KOs) in the 4th round to claim the WBO belt on HBO at the Turning Stone Resort Casino in Verona, New York. The Munguia vs. Ali fight averaged 711,000 viewers ON HBO with a peak of 779,000 viewers. These are very good numbers for the 21-year-old Munguia, who was being seen for the first time by many casual boxing fans in the U.S. The big punching Munguia came into the fight viewed as one of the best prospects in the middleweight division, and he lived up to his high expectations in knocking Ali down 4 times in the fight. The fight was stopped after Munguia knocked Ali down in the 4th. Ali jumped up off the canvas, but the referee Ray Rosato had seen enough and stopped the contest. The fight was stopped a 1:02 of round 4. Munguia knocked Ali down twice in round 2, once in round 2 and once more in round 4. There was a missed knocked down in round 3 for Munguia. Sadam Ali should not have agreed to take the fight with Munguia. His management should have rejected Munguia as the replacement opponent for Liam Smith, because there was too much of a weight and power disparity between the two fighters. Maybe if Ali had more time to train for Munguia’s size and power, he could have done better. But to take the fight with the monstrous-punching Munguia, it was a mistake. With Saul Canelo Alvarez on the shelf due to his suspension, Munguia showed off his punching power for his promoters at Golden Boy in thrashing Sadam Ali from start to finish in what was supposed to have been a competitive fight going in. It was believed that Ali would either out-box the bigger, slower Munguia or he would be overwhelmed by his size and punching power. That turned out to be the case, as Munguia knocked Ali down with his first left hook that he threw in round 1. That was easily the best punch that Munguia threw in the fight, because it connected cleanly and it hurt Ali to the point where he never came back from it. Watching Ali get destroyed in such a definitive way by Munguia, it can’t help but make you interested in the future of this young kid from Mexico. He looks like he’s got the goods to be a very good fighter for a long time, as long as he’s not rushed by his promoters into a fight against someone a little too advanced. Sadam Ali learned a painful lesson in this fight with Munguia. That lesson is that you don’t stand in front of a fighter with more power and size than you. The World Boxing Organization has ordered Munguia to make his first defense of his title against former WBO light middleweight champion Liam Smith. That fight is possible for August or September, according to Smith’s promoter Frank Warren. If Munguia can beat Smith as easily as he did Ali, it’ll be a real accomplishment. It took Saul Canelo Alvarez 9 rounds to knockout Smith in their fight in September 2016. Sadam Ali won the WBO 154lb title last December in beating Miguel Cotto by a 12 round unanimous decision. Ali had moved up from welterweight to take the fight with Cotto. Ali was able to win the fight after Cotto suffered an injury in the 7th. For Munguia, he was fortunate to get the fight with Ali, because he came close to getting a fight against IBF/IBO/WBA/WBC middleweight champion Gennady Golovkin on May 5. The Nevada State Athletic Commission didn’t sanction the fight because of Munguia’s inexperience and his size. As it turns out, Munguia weighed 170lbs for his fight with Ali, and he was every bit as big as Golovkin after rehydrating. Golden Boy Promotions then matched Munguia against Sadam Ali after Liam Smith pulled out of the fight because of a skin allergy. The 21-year-old Munguia probably would have lost to Golovkin. Munguia should be very happy that the Nevada Commission stepped in and chose not to sanction the Golovkin fight, because he wasn’t ready for that kind of an opponent. Golovkin arguably hits harder than Munguia, and he has a lot more facets to his game on top of the huge experience advantage he would have. Munguia should stay at 154 for as long as he can, because his middleweight size gives him of an advantage over the smaller fighters. When guys are young like Munguia, they can melt down easier than older fighters to compete in a weight class that is well below their natural size. Guys like Saul Canelo Alvarez and Julio Cesar Chavez Jr. were able to melt down in weight to compete in divisions below their size, and this helped bring them a lot of success that they otherwise likely wouldn’t have had if they were in weight classes that were suited to their bodies. If Munguia can get away with fighting at 154 until he’s 26, like Canelo did, then he’ll have 5 good years with him squashing smaller opponents. Some boxing fans call guys like Munguia “weight bullies,” but if you can get away with it, then he should stay at 154 for as many years as he can. Liam Smith is one of the best fighters in the 154lb weight division, but he’s not in the top 3. Munguia will need to prove that he can beat Smith in style before his management gives him the green light to fight the best fighters at 154 liker Jermell Charlo, Erislandy Lara and Jarrett Hurd. In the co-feature, WBO super bantamweight champion Rey Vargas beat Azat Hovhannisyan by a 12 round unanimous decision in a fight that averaged 619,000 viewers with an excellent peak of 740,000 viewers.